This past week, as we took acoustical measurements at the Calvin College Fine Arts Center in Grand Rapids, Michigan, a music teacher poked her head into the auditorium and asked if aliens had landed. “Well, not exactly”, I said. But I admitted that it did look and sound a lot like it. Binaural “dummy head” recording isn’t exactly something you see (or hear) everyday, so here is a brief glance at why this technique is used by acousticians. Binaural recording heads offer a superior method of capturing and representing audio as heard by the human ear. With a stereo pair of microphones attached to the dummy’s ear canals, the head “hears” the nuances and changes in sound as it “hits” and wraps itself around the face and body. In other words, as the sound travels from the source to the receiver (say, for example, sound traveling from a loudspeaker to your ear) the sound field is interrupted by the physical presence of your body. As the sound reaches you, a portion of it is altered by the impact it makes on your head and shoulders before entering your ears and being heard. The dummy head helps to recreate how that sound diffracts, reflects, and reverberates off your body before entering the ear, and it gives a good representation of how your ears will hear the sound in real life. In the auditorium that day, the sound source was a weighted sweep audio file that we played from our laptops to a dodecahedron-shaped speaker on the stage (with individual speakers on all twelve sides). 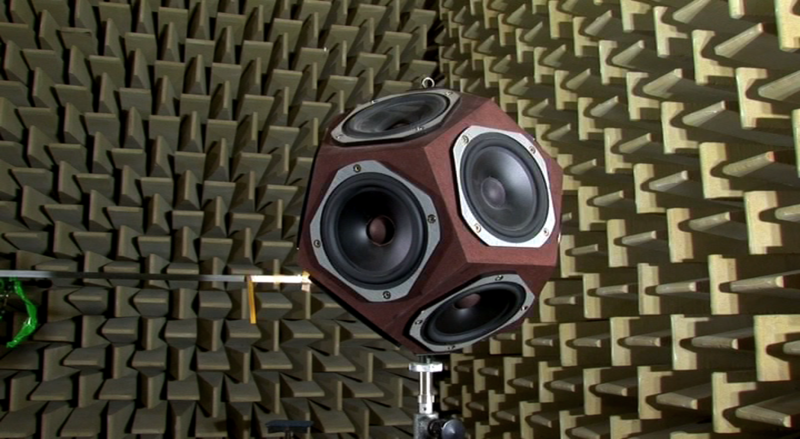 The “dodec,” as we call it, emits sound in an omnidirectional pattern, delivering audio into the room at a simultaneous 360°. With the dodec as our sound source and the dummy head as our receiver, we were set to make accurate measurements of the acoustical attributes of the auditorium. We took readings at dozens of seats throughout the auditorium, recorded the results on our computers, and then moved the dodec to a new staging location and repeated the tests. By measuring the same seats, but with different sound source locations and conditions, we were able to identify the acoustical “fingerprint” of the space. This data, combined with a 3D model of the room, gave us a sophisticated graphical representation of the room’s acoustical response. After two days of measurements, we left the Fine Arts Center knowing what listeners would hear at any given seat throughout the auditorium, and we did it all without calling in Mulder and Scully for backup. Really enjoyed this post. Made it easy for a layman like me to understand and appreciate. Also, the photo really helped. Great job. Keep up the good work! where’d you get the dummy head? This particular head is a vintage piece with custom high end mics, so it’s one of a kind. There are a number of popular binaural head manufacturers including Neumann, Head Acoustics, and Manikin, just to name a few.